I’m not sure where I found the link, probably on Twitter, but I ran across this list of must-read popular science books. It’s definitely not the list I would have compiled (though I admit that my pop-sci reading history is somewhat paltry). I count only two books on the list that I’ve read completely (John Allen Paulos’s Innumeracy and The Disappearing Spoon by Sam Kean, though his follow-up is on there, and I expect to devour that when it’s in paperback), four other books that I’ve started and not finished (Neil Shubin’s Your Inner Fish, Darrell Huff’s How to Lie with Statistics, Richard Feynman’s Six Easy Pieces, and Richard Wiseman’s Paranormality, which I’m going to go back to when I finish Richard III), and four more that I either own or wanted to read before seeing the list (The Selfish Gene, Mistakes Were Made, Supersense, and Nonsense on Stilts). Many of the authors are recognizable, though the choices seem a little odd. Take Dawkins, for instance: I typically see Climbing Mount Improbable and Unweaving the Rainbow on lists like these before River Out of Eden. I would think The Panda’s Thumb or Full House would top Stephen Jay Gould’s list before Wonderful Life. Then there are the glaring omissions. Not one Carl Sagan book? No Death from the Skies? No Neil deGrasse Tyson or Lawrence Krauss or Michio Kaku? No A Brief History of Time? No women? Okay, that last one isn’t fair. There are indeed women on the list. Two of them: Carol Tavris and Mary Roach, out of 34 different authors, by my quick count (some books had multiple authors; some authors were on the list multiple times, including Marcus Chown, a name that was previously unknown to me). Somehow, when compiling “must-read” popular science books, three books by Marcus Chown and two “very short introduction” books merit inclusion when books like Silent Spring and Gorillas in the Mist don’t. That’s really not much, and I think you’d be hard-pressed to argue that a world-altering book like Silent Spring doesn’t merit mention over, say, The Violinist’s Thumb, which has been out for less than a year. 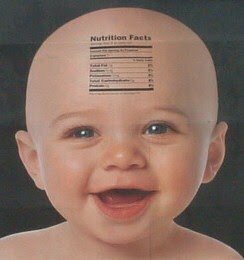 It isn’t a matter of intentional sexism, but it’s this sort of casual blindness to gender imbalances that helps to create and perpetuate the myth that science is “more of a guy thing.” Correcting that image is going to take a good long time and a lot of work, but little steps–like making sure that your “must-read” popular science book list isn’t a giant sausage fest–are not that difficult, and do add up just as the little omissions and microaggressions add up on the other side of things. 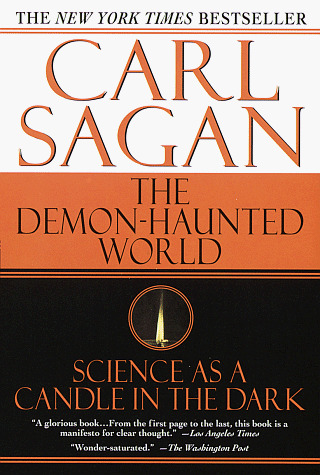 I just finished Carl Sagan’s The Demon-Haunted World: Science as a Candle in the Dark about a minute ago. I’ve been working through it for months, reading bits and pieces of it whenever I had free time, and upon seeing how gorgeous it was outside and that there were only about 35 pages left, I resolved to finish it today. I ended up coming inside for the last bits, due to rising breezes and diminishing sunlight. The other phenomenon I’ve experienced is the sheer wealth of information contained within that orange-black-and-white tome. I’ve found myself craving a highlighter, that I might go over the passages that really stand out and speak to me, but I’d have a book positively dripping with yellow. I’ve been honestly and without hyperbole describing it as “the best book ever written on the subject of everything.” I lament the fact that I won’t be able to keep all this in my head for the rest of my life. The passages throughout this book are so perfect, so useful, so relevant, that I’d like to have them at my fingertips for quoting and showing off in various arguments and other writings. So, as I finished the acknowledgments, these two phenomena collided. Dr. Sagan had anticipated this, too. I nearly cried. Thanks, Carl. You’re the best.